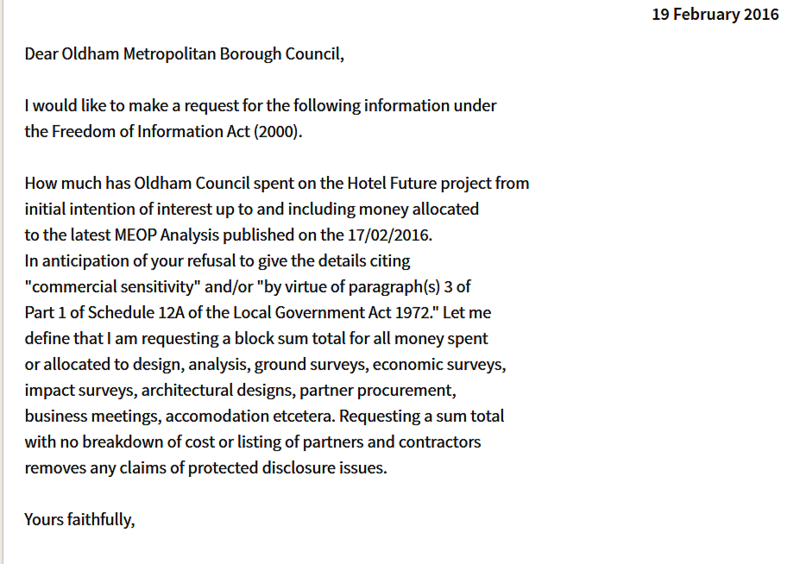 Oldham Council are spending yet more tax payers money on yet another Hotel Future feasability study. Originally in 2012 Hotel Future was a Manchester Hotelliers Association development that was approached by Oldham Council to have thedevelopment in Oldham. Three years on the Manchester Hotelliers Association development has become one that was described by Oldham Council as only being able to go forward if the council develops itself. We have made a Freedon of Information request to Oldham Council asking how much they have squandered over the last three years on development of a scheme which was due to be delivered summer 2015 but which will not have broke ground by the start of 2017. We expect their transparent democracy claims to be met with the usual refusal to disclose information because of commercial sensitivity.